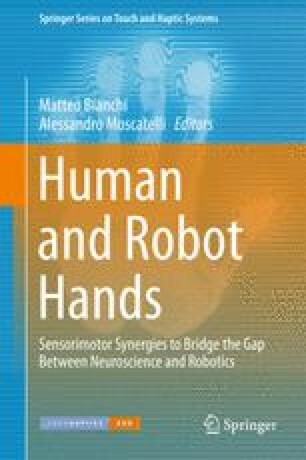 Taking inspiration from the neuroscientific findings on hand synergies discussed in the first part of the book, in this chapter we present the Pisa/IIT SoftHand, a novel robot hand prototype. The design moves under the guidelines of making an hardware robust and easy to control, preserving an high level of grasping capabilities and an aspect as similar as possible to the human counterpart. First, the main theoretical tools used to enable such simplification are presented, as for example the notion of soft synergies. A discussion of some possible actuation schemes shows that a straightforward implementation of the soft synergy idea in an effective design is not trivial. The proposed approach, called adaptive synergy, rests on ideas coming from underactuated hand design, offering a design method to implement the desired set of soft synergies as demonstrated both with simulations and experiments. As a particular instance of application of the synthesis method of adaptive synergies, the Pisa/IIT SoftHand is described in detail. The hand has 19 joints, but only uses one actuator to activate its adaptive synergy. Of particular relevance in its design is the very soft and safe, yet powerful and extremely robust structure, obtained through the use of innovative articulations and ligaments replacing conventional joint design. Moreover, in this work, summarizing results presented in previous papers, a discussion is presented about how a new set of possibilities is open from paradigm shift in manipulation approaches, moving from manipulation with rigid to soft hands. The authors would like to thank Andrea Di Basco, Fabrizio Vivaldi, Simone Tono and Emanuele Silvestro for their valuable help in the realization of the prototypes. This work was supported by the European Commission under the CP-IP grant no. 248587 “THE Hand Embodied”, within the FP7-2007-2013 program “Cognitive Systems and Robotics”, the grant no. 645599 “SOMA: Soft-bodied Intelligence for Manipulation”, funded under H2020-EU-2115, the ERC Advanced Grant no. 291166 “SoftHands: A Theory of Soft Synergies for a New Generation of Artificial Hands”.